I recently had the honor of meeting fashion designer Edo Popken during a media dinner held at his boutique on Dragon Street. The Swiss menswear designer opened his Dallas location (only one in the United States) last year. Since then he's become a fashion icon here. His refreshing perspective is a nice addition to the up-and-coming hotspot, the Design District. Unique brands like Edo Popken only make our city more fashionable! Shorts tailored like suit pants. Color-blocked polo shirts. Beautiful ties. I could have spent the whole day taking in all of the uplifting prints, color combinations, and silhouettes. I think I can speak for everyone in attendance that night: it was so inspiring to hear Mr. Popken talk about his brand. You could feel his dedication and passion. Not only is he talented, he's also very sweet and humble. He has also been involved with DIFFA events in Dallas to raise funds for organizations that help fight HIV/AIDS. Edo only produces 111 of each garment with a limited edition numbered tag. He only uses three shades of each colorway so that you can pair items from his current collection with past season items. And all of his fabrics are custom-made for him. That's what I call quality over quantity! I can't wait to bring my dad to the Edo Popken boutique soon to get styled. My dad isn't the most adventurous when it comes to fashion, but I think Edo will get him out of his comfort zone! 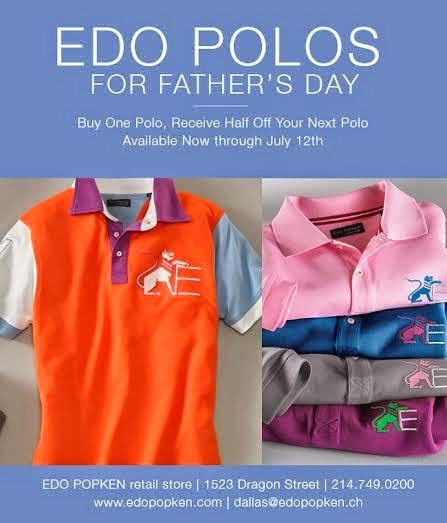 Speaking of dads, Edo Popken is having a Father's Day special through July 12. Buy one polo, get the next half off. It's a pretty sweet deal that I'm sure will be much appreciated.